Headaches are a common reason for a visit to a health care practitioner. Almost everyone suffers headaches occasionally. Some people have more serious types of headaches requiring specialized medical treatment. On rare occasions, a headache may be a symptom of a life-threatening problem. The "worst headache of your life" may be a symptom of a medical emergency. People with this symptom should be evaluated emergently. You are experiencing the worst headache of your life, especially if you rarely suffer from headaches. Having the worst headache of your life, especially if you rarely suffer from headaches, makes it an emergent situation. A headache associated with a fever. If the headache and fever are accompanied by a stiff neck, go to an emergency department immediately for evaluation. The doctor will ask you questions about your headache and other medical problems and will do a physical examination. Blood or urine tests may be ordered. Specialized imaging tests, such as a CT scan or an MRI may be performed under certain circumstances, either as an emergency procedure or on a more routine basis. Regular X-rays are rarely helpful. Certain types of headaches may require the doctor to do a lumbar puncture or spinal tap. This test involves the removal of a sample of cerebrospinal fluid (the fluid around the brain and spinal cord) to examine for signs of infection, bleeding, or other physiological problems. Lumbar puncture is a safe test, but unfortunately the removal of spinal fluid may make the patient's headache transiently worse. In some cases referral to a specialist may be necessary, depending on the results of specific tests; for example, a referral to a neurosurgeon is usually ordered if bleeding in the brain is found. Most affected individuals usually may take an over-the-counter (OTC) headache medication, such as acetaminophen (Tylenol) to reduce the headache pain; taking ibuprofen (Advil) or other nonsteroidal anti-inflammatory drugs (NSAIDs) is not advised because if the headache is due to bleeding in the brain, the medication may make it worse. If the headache is truly the worst headache of your life you should go to an emergency department immediately. Some tension headaches are relieved if the person removes themselves from the situation causing stress. A cool, wet towel over the forehead may reduce symptoms. A person with chronic migraine headaches should discuss a treatment plan with their health care practitioner. If the affected individual continues to visit the emergency department, repeated CT scans may be performed, resulting in unnecessary radiation exposure, and no follow-up plan for the patient for a potentially treatable condition. Treatment of the headache depends on the specific diagnosis. It is important for the patient to keep their primary care doctor updated on visits to the emergency department, so that the doctor is aware of any changes that may need to be made to the patient's treatment plan, especially if they are managing chronic migraine headaches. 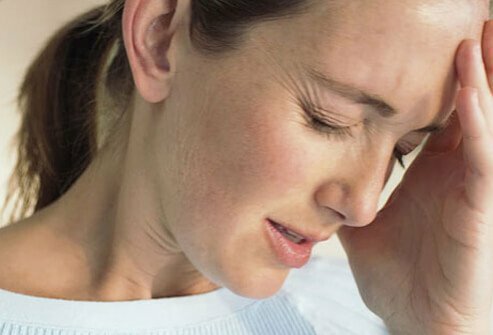 Headaches that are not life-threatening, such as tension, mild, cluster, or migraine headaches may be treated with a variety of pain medications. More serious headaches will require specific treatments prescribed by the doctor, possibly with the involvement of a specialist. Most headaches are not serious and will resolve with or without treatment. Headaches of a more serious nature, migraines, for example, should be evaluated by a doctor or an appropriate medical specialist. Some headaches have a more dire prognosis, especially if they are left untreated. For example, headaches caused by brain infection or bleeding may result in severe disabilities or death if left untreated. Even with treatment, in some individuals, the prognosis can still be poor if the infection is treated at a later stage, or if there is a large amount of bleeding into the brain. Brisman, JL, MD. "Neurosurgery for Cerebral Aneurysm." Medscape. Updated: Sep 02, 2016. Centers for Disease Control and Prevention. "Menningitis." Updated: Oct 20, 2016. Dafer, RM. "Migraine." Medscape. Updated: Mar 09, 2016. What was the cause of your severe headache? What other signs and symptoms have you experienced with this type of severe headache? How was your severe headache treated?